At this point, Ilhan Omar is a living, breathing Rosetta stone for the absurdity and menace of politics in the Trump era. Consider the situation: as Omar is slammed from all sides for supposedly spreading racist “tropes” — namely the idea that Jews hold dual loyalties and manipulate US politics — her detractors suggest that, as a Muslim immigrant, she may be a disloyal American who makes common cause with Islamic terrorists. And one side making these accusations is a Republican Party that is increasingly making common cause with open white supremacists and antisemites. All the while, Omar receives death threats from unhinged racists. Cue firestorm. Taking a break from whining about the language police and mocking easily triggered “snowflakes,” prominent right-wing figures used their platforms to broadcast the supposed emotional pain they had suffered because Omar had described the attack (“some people did something”) in a way that failed, in their eyes, to show enough respect for the victims. As expected, you had bottom-feeders like online conspiracy theorist Laura Loomer jumping in, calling Islam a “cancer on humanity,” claiming Omar was “pushing for another 9/11,” and trying to make “terrorism mainstream.” But Loomer’s outright bigotry was only a cranked-up version of the barely veiled racist incitement of the “mainstream” right’s response. Shortly after this, the president himself tweeted a video that intercut footage of Omar’s remarks with images of the World Trade Center attack, leading to a spike in death threats against the congresswoman over the weekend, some of them specifically mentioning the video. Meanwhile, right-wing commentator Ben Shapiro, currently in the process of touring the country mocking college students for being too easily offended, whined that her words had been “insensitive,” that she had failed to describe the attack as a “truly terrible tragedy” and “an act of tremendous evil,” all before absurdly claiming there had been no “Islamophobic backlash” in the wake of the attacks. Unfortunately for Shapiro, facts don’t care about his feelings. It hardly needs to be said that this is a willful attempt to drum up outrage over nothing. One doesn’t need to even watch Omar’s full speech — all about how Muslims have been historically marginalized, treated as second-class citizens, and associated with violence — to understand what she was doing with those words: divorcing the murderous actions of a small group of extremists from the lives of a billion ordinary people, in order to point out the unfair treatment Muslims received because of what those few individuals had done. Fox & Friends has long been a cesspool of anti-Muslim bigotry, with Kilmeade himself claiming at various times that “all terrorists are Muslims” and that “the next Hamburg cell could be right downtown,” referring to the “Ground Zero Mosque” in New York City. McDaniel steadfastly supported Islamophobic firebrand Roy Moore in Alabama and falsely claimed that Muslim Rep. Keith Ellison had an “ongoing relationship with Louis Farrakhan.” Ben Shapiro has claimed that “more than half the Muslims on Earth” are “radicalized,” and that “Arabs like to bomb crap and live in open sewage.” As for Trump, more on him later. This kind of ugliness is par for the course from the Right, which has been encouraging fear of Muslims since the September 11 attacks. But what makes Omar’s case especially frustrating is that this right-wing effort is being buttressed by the liberal center. It was prominent Democrats like Nancy Pelosi and Chelsea Clinton who jumped on the earlier controversies around Omar to give credence to the right-wing narrative that she was a bigot. A number of liberal columnists piled on, sometimes falsely claiming that her comments were about Jews, rather than pro-Israel activists. In a piece of supposedly straight reporting, the New York Times charged that Omar had been “peddling anti-Semitic stereotypes about the undue influence of Jewish lobbies” (a term that Omar never actually used), before noting that these were “common talking points in extremist Islamist circles.” The article has since been altered to make clear these were accusations rather than objective claims, though the line linking her rhetoric to Islamic extremists remains. Despite the immediate hand-wringing over Omar supposedly trafficking in “tropes,” a number of prominent Democrats seemed unperturbed by the casual association of a Muslim congresswoman with terrorists, a racist trope if there ever was one. Nor did they seem concerned over doubts being raised about her allegiances, even though Muslims and Arabs frequently have their loyalty as Americans questioned. In fact, several have once again jumped in to implicitly give weight to the right-wing narrative. New York Rep. Max Rose, who, like an increasing number of Democratic lawmakers, served in the armed forces in operations in one of the many Muslim-majority countries the military is present in right now, went on Fox News to call her remarks “insensitive” and “offensive.” DNC chair Tom Perez (who needlessly jumped in to quash Muslim ex-congressman Keith Ellison’s bid for that position) declined repeatedly to defend Omar. Kirsten Gillibrand said she couldn’t “accept any minimizing” of victims’ pain in her condemnation of Trump. But the prize for most pathetic response goes to Speaker Nancy Pelosi, who first equivocated, before proclaiming that “any discussion of [September 11] must be done with reverence” and that Trump was wrong to “make anyone less safe,” and capped it off by meeting with the small band of Blairite Labour MPs who have been using the same kinds of trumped up accusations of antisemitism Omar faced to attack Jeremy Corbyn in the UK. 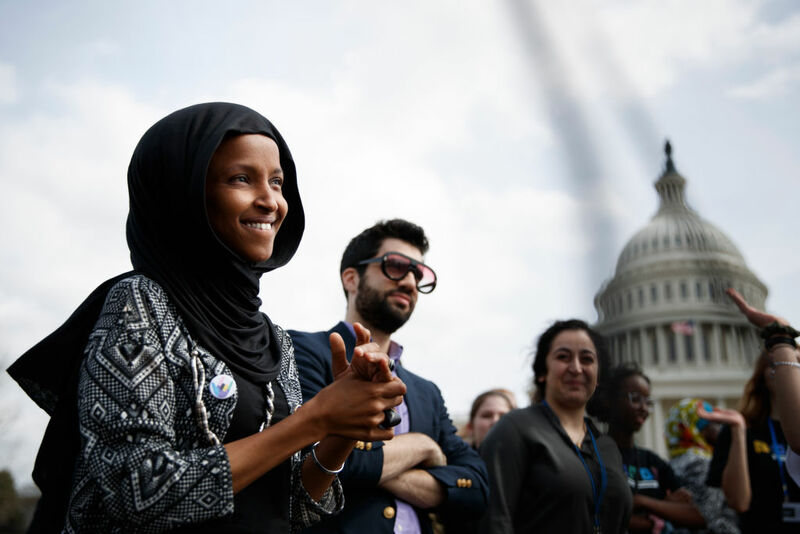 There are several reasons why the liberal center’s indulgence of right-wing narratives about Omar are so concerning. Anti-Muslim bigotry is the most socially acceptable form of intolerance in Western societies, and besides being bad in itself, it is also the most foundational form of bigotry for today’s global far right. Let’s be clear: anti-Muslim racism is by no means not the only type of bigotry in which today’s far right indulges. Antisemitism is on the rise worldwide, and both the far and “mainstream” right continue to indulge in the anti-immigrant, anti-black racism they’ve spent decades spreading. But Islamophobia stands at the core of the far right’s rise in Western countries and is key to its growing appeal. Last year’s terrorist attack on a Pittsburgh synagogue was a clear act of antisemitic hatred. But it was also heavily motivated by the attacker’s anti-Muslim beliefs: he re-posted a statement accusing Jews of bringing “EVIL Muslims into the Country,” and his final social media post was about a Jewish refugee settlement agency he charged with “bring[ing] invaders in that kill our people.” This linkage wasn’t unique to him, but one shared by a plethora of white supremacists past and present. It’s the same in other parts of the world. Hatred of Islam and Muslims was the driving force of the ideology of the white supremacist who carried out the appalling 2011 attack in Norway. The same, obviously, goes for the terrorist who gunned down fifty people in a New Zealand mosque last month. Far-right British commentator Katie Hopkins has aimed much of her bigoted vitriol at Muslims, particularly immigrants, an approach she shares with other members of the British far right. As British antiracist charity Hope Not Hate recently determined, anti-Muslim bigotry replaced immigration as the “key driver” of far-right groups in the country. Across Europe and North America, such groups have adopted the symbolism of the Crusades and other medieval European imagery in an attempt to cast the modern era as a new clash of civilizations between Christianity and Islam. At the same time, Muslims remain the most unfavorably viewed religious group in both the United States and Europe, more so even than Jews. According to 2016 survey data collected by YouGov, Muslims were by far the social group least positively viewed by every type of voter profiled, including Democrats. Anti-Muslim sentiment is, paradoxically, both the most socially accepted form of bigotry in Western countries and the particular bigotry that most drives the increasingly prominent far-right movements in those countries — precisely what makes it so dangerous. So when liberals, centrists, and Democrats lend credence to far-right narratives about people like Ilhan Omar — or when they “defend” them by only offering mealy-mouthed equivocation — they’re not just acting cowardly. They’re assisting the rise and spread of an incipient, renewed fascism across Europe and North America. For all its talk, the liberal establishment in practice is happy to set aside its rhetoric about diversity, identity, and marginalized groups whenever ideologically convenient. But we already knew that. Cynicism is something we’ve come to expect from them. But must they also give a helping hand to fascists while they’re at it?